***Live Zoom Call Q & A Scheduled for Wednesday, April 24th at 7pm C.T. You have questions. We have answers. Join us! 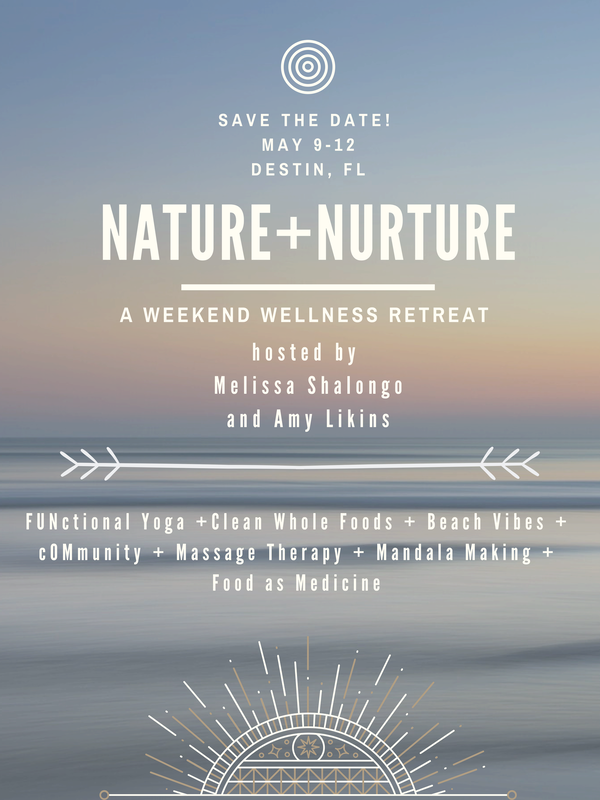 If this sounds like heaven, then join Melissa and Amy for a weekend of wellness on the beautiful Emerald Coast of Florida. Reconnect to nature on the sugar white sands of Crystal Beach while nurturing your mind, body and spirit through FUNctional yoga, Vital Nourishment and Holistic Wellness. ​If caring for others has taken precedence over caring for yourself then this retreat is for you! Prices start at $799 for the weekend! Reconnect with nature, Renew your spirit, and Reset your mind/body! Lodging: 4 days/3 nights of luxury accommodations within a block and a half from the Gulf with dedicated beach access. Each bedroom comes with a private bath and smart tv, and with a tankless hot water heater no one ever runs out of hot water! Guests can enjoy the large, private, sport-bottom swimming pool, or play a game of horse on the full basketball court, or choose to lounge in one of two spacious living areas. The chef's kitchen makes it ideal to serve up delicious meals and there is plenty of room for everyone to sit and enjoy. Meals: Daily brunch is served with nutrient dense, clean whole foods designed to leave you feeling nourished and energized for the day. Nightly dinners will feature locally sourced, artisanal dishes and cocktails prepared with a "food is medicine" mindset to provide a culinary experience for all your senses. All meals prepared by an integrative nutrition specialist and will highlight plant based foods, non-dairy items, and gluten free goodness. Dietary restrictions can be accommodated. Yoga: Daily "FUNctional flows" are thoughtfully sequenced to provide musculoskeletal balance and help support everyday life functioning. Each 90-minute practice is designed to meet students where they are and will include yoga postures, breath work, and meditation. All classes are taught by experienced, certified yoga instructors and all levels of experience are welcome.. Dynamic Workshops: Engaging afternoon workshops will be offered to help integrate healthy lifestyle changes and to inspire participants to live their truest, fullest and best selves. We'll tap into our innate creativity and learn practical tools to help us progress along our path to wholeness and wellbeing, our true fundamental nature. Snacks, coffee, tea and water provided throughout the day. Experience an "all-levels", mindful movement practice designed to meet you where you are, and support your everyday functioning in life. Get inspired on your journey to wellbeing during an afternoon workshop. Gain the tools necessary to start living your best life. Amy is an integrative nutrition and wellness specialist with a master's degree in holisitic nutrition and wellness. Amy's approach is multifaceted focusing on using whole foods, diet, exercise, meditation, relaxation and lifestyle changes to bring about your healthiest body and mind. ​Amy has taught yoga on the Emerald Coast since 2000 and ran her own Organic Cafe and Juice Bar for more than 10 years. She currently travels as a private chef for yoga retreats, teaches yoga and wellness workshops, and works with clients and small groups to create nutrition and wellness plans. Melissa cultivated her unique, interdisciplinary approach to yoga at the Nosara Yoga Institute of Costa Rica where she earned her 200 and 500-hr teaching credentials under the instruction of Brahmanand and Amba Stapleton. direct experience is the ultimate authority in yoga and in life. With a passion for making yoga accessible to everyone, she holds space for students to cultivate their own kinesthetic intelligence and meets people where they are.